Frankie and Clover's Strictly Come Dancing Blog! : A little musicality, please! After being in the dance-off and now in the death slot, it didn't look great for Davood. Although, the jive certainly lends itself to his Labrador-esque energy and Nadiya's manic choreography, I think this was their most coherent routine so far. Saying that, his technique needs to improve or he's going to start lagging behind the others pretty quickly. This was also the start of some rather odd outfits tonight too, Nadiya looking positively middle-aged in that heavy dress. What are they trying to do to Davood? Totes unfair that he was in the death slot - but they seem to do this to dance off celebs don't they? Do they completely write them off once they've come bottom? Boo hiss. Having said that, I agree with F., if he survives the week, he needs to show some oomph. His performances are increasingly forgettable. Thankfully Mollie is back with us after barely surviving those salsa lifts last week, here's a nice staid VW for you dear. Despite being sugary enough to give you a toothache, I quite liked this, maybe it was because of the minimal faff. Yes, it didn't set the world alight, but it was good to see her making some progress. I found this weirdly uncomfortable to watch and I don't know why. Perhaps it was the saccharine over-acting. . Mollie is improving but she needs a wow-Rachel-Stevens-rumba moment. And soon. Ah, king of dad dancers survived the samba to wiggle another day. Now, this somehow got better as it went along, and it was quite a good routine from Karen, but Simon is lacking in skill....and an Achilles apparently. It was just a bit leaden and no amount of facial expression, or yellow tartan, can save that. Even Rupert the Bear wouldn't have combined that waistcoat with the pants. And he's a fictional bear. I can't remember the dance. I was too distracted by that garish yellow. Ah, we've all been waiting for a Debbie and Gio rumba, the Strictly props team were standing by with a bucket of cold water in case things got out of hand. Alas, they went for pretty, classy, traditional rumba, booo! Not really, it was good, and Debbie looked like she she'd really worked on the hip action. I was quite thankful that this wasn't one of those painfully slow rumbas too, good work guys! I'm not sure it was as good as the judges said but I was so super glad to see Debbie do well I don't actually care. I never would have thought she would have been one of my favourites this year but there you go. What I love is that she took the criticism from last week and worked on it. That's what it's all about. And I'm not talking about the hokey-cokey. Meh. Not good enough to be good. Not bad enough to be good. After last week's revelation of a quickstep last week, we were all ready to see what Susan would do next. 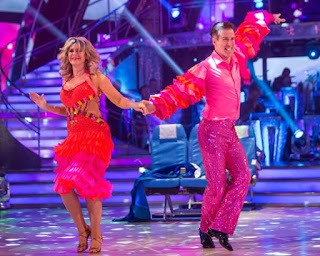 There was a fair bit of faff at the start, but when it kicked in it was great to see Kevin sticking with proper routines and this was full of cha cha. It wasn't as technically achieved as last week, but it was full of pep and brought us all to life. Susan is the breakout star of Strictly 2017. Charleston, American Smooth, Quickstep are always going to be more her style. Latin is a tough one to crack. This was entertaining, but technique-wise not great. But somehow with Susan, she sells it any way. So much wafting...Beautiful song, completely distracted by the all-over-the-place choreography. And this all came after them saying all week this was going to be Aston's first foray into classic ballroom. I was very annoyed. Oh crikey, I must have fallen asleep momentarily because I barely remember it. Erm, Janette's dress was lovely. Oh my word, the hair! The never-ending samba roll! Anton's sleeves! Anton dancing on one leg like a flamingo on acid! What I loved about this was that it was so crazy and came out of nowhere, there was no hint on ITT this week that they were going so full-on and it was all the better for it. Yeah, it was technically all over the place, but a delightful surprise. Ruth, 1979 called. It wants its hair back. You know, I was just about to tweet about Strictly Ballroom and was searching for a gif of Ken Railings just as Craig made the same comparison. It was so camp, and such a parody. And that's why I LOVED it. Anton's trousers are life. Beautiful routine from Aljaz, that's what proper ballroom looks like. All that, plus the hilarious trolling move of Gemma wafting while in hold! This was lovely and held my attention all the way through, which is hard for a foxtrot. Although I did wonder what was so fascinating about the ceiling, she didn't take her eyes off it for a second. I could see this girl winning this. Loving how both Joe and Katya went all-in with the outfits this week, there was no mistaking what this was! And what's more, I think Joe finally had his breakout dance! There was so much power and commitment in this, and it should hopefully drive his confidence into next week. Yes, the shaping was a bit wonky in places, but I don't think he could have done that in week 1. But then Shirley gave it a 10 and sent me into a tailspin of confusion! WUT? 10? I'm not sure I agree with that one. Great intro with arm-shaping but his body movement is very uncomfortable; he reminds me of Jake Wood in that respect. I'm not saying this wasn't good. But such high scores did surprise me somewhat. Just going to get down to it: the song didn't work for me. Yes, the arrangement was correct for a samba, but it is too subdued, and Alex works best when she's in firecracker mode. Bags of content and hip action though - that was a filthy samba roll! I could have done with some feathers, to me it's not a proper samba without feathers on yer bum. At first I was like NO WAY RUBBISH SONG CHOICE. Then it started and I was like OOH I LIKE THE ARRANGEMENT ACTUALLY. Then it continued and I was like MEH. Loved Alex's samba style though and it was grossly undermarked in comparison to Joe. I agree with Frankie. I want feathers! Fruit headpieces! Frills! Jonnie showed us last week he can do ballroom, so I was excited to see what a quickstep would bring - and he definitely delivered! A nice nippy little routine from Oti, and the way he's learned to perform has really helped raise his game. Plus you really get a sense of teamwork from these two, which livens up any performance, I really couldn't see him dancing with anyone else. Loved this. Think it was my favourite of the evening over all. It was so nippy and tight. The attempts at acting were endearingly cute. Another one to watch.